Movie producers released a statement on the deadly fire, saying in part, "our hearts ache in solidarity with his family"
New York is a city in mourning after FDNY firefighter Michael Davidson was killed in a movie set blaze in Harlem. Marc Santia and Erica Byfield report. A decorated FDNY firefighter and father of four young children died when a fire erupted in a Harlem apartment building where a star-studded movie directed by Edward Norton had a shoot overnight, officials say. Michael R. Davidson, a 37-year-old Floral Park resident who has been with the FDNY for 15 years, died from his injuries while battling the fire at a five-story building on St. Nicholas Avenue and 149th Street, the FDNY said early Friday. The blaze broke out on the set of "Motherless Brooklyn," which, according to IMDB, is being directed by Norton and stars Bruce Willis, Willem Dafoe, Alec Baldwin, Gugu Mbatha-Raw and Leslie Mann. An NBC 4 New York photographer spoke to one of the actors, who said they had just finished filming for the day when they smelled smoke while they were breaking down. They called the fire department around 11 p.m. Thursday. Davidson was the nozzleman, meaning his job was to run the hoseline of Engine 69, which was the first to arrive at the five-alarm scene. The crew rushed to the basement, but the FDNY said once they got down there, the fire got worse, forcing the firefighters to retreat from the building. Fire Commissioner Daniel Nigro said Davidson somehow got separated from his group "inside the rapidly deteriorating fire conditions." 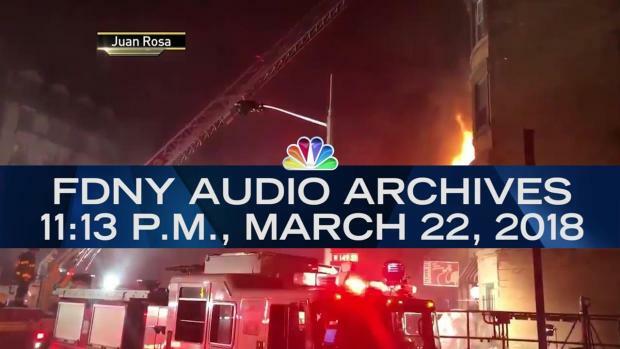 In FDNY audio from a deadly fire in Harlem Thursday night, firefighters can be heard reporting a fellow member missing. Warning: audio may be distressing to some. They turned back to search for him. When firefighters found him, he was unconscious. He later died of critical injuries sustained while battling the blaze. Officials said two other firefighters suffered serious burns in the blaze. Those injured firefighters are being treated at an area hospital's burn center. Three other civilians suffered minor injuries. Davidson, who has been cited for his bravery and life-saving actions four times during his career, leaves behind his wife and four young children -- three daughters, ages 7, 3, and 1, and a 6-year-old son. He comes from a long line of firefighters. His father, Robert, who is now retired worked in the same firehouse as Davidson. His brother, an 11-year veteran, works at Engine 88 in the Bronx. Funeral arrangements are pending. A procession of FDNY trucks escorted his body to a funeral home on Long Island Friday afternoon. 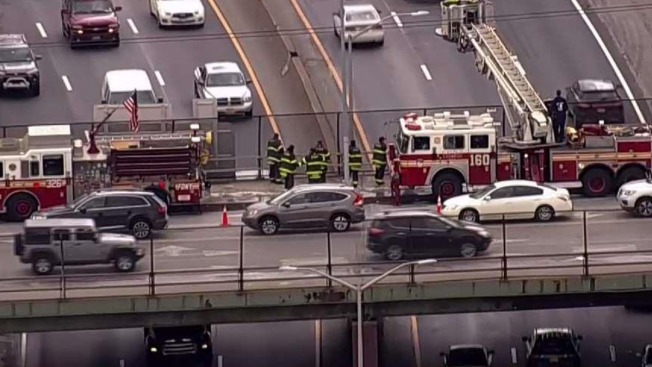 Local FDNY trucks and firefighters stood on overpasses on the route, solemnly saluting Davidson's procession as it passed. Mourners filed to Davidson's firehouse throughout the day Friday; some cried, others left flowers outside. The body of fallen firefighter Michael R. Davidson is loaded onto an FDNY EMS truck before being taken escorted by a procession on Long Island Expressway to a funeral home on Long Island. “Our entire department, our entire city, mourns this horrific loss of a very brave firefighter," Nigro said. "Our hearts and our prayers go out to the family and may God rest his soul." Mayor de Blasio cut short a trip to return to New York City and toured the scene of the deadly fire along with Nigro Friday evening. This is an awful night. We’ve lost an NYC firefighter. Public briefing shortly at Harlem Hospital. Sick to my stomach. Davidson is the 1,150th firefighter to die in the line of duty in the FDNY's 153-year history. His death comes about a week after two FDNY firefighters, who were also members of the 106th Rescue Wing of the Air National Guard based in Westhampton Beach, died in a U.S. helicopter crash in Iraq. Floral Park neighbor Peggy Healy was devastated to learn of his death. She said the beloved firefighter had just shoveled their snow a day ago. "I yelled across and said, 'Thank you, Michael!' And he said, 'Oh, you're very welcome,'" said Healy. "He was such kind man, such a kind man. It's just devastating." She said Davidson doted on his young children, and she'd always see him takng the kids to the bus stop and picking them up. "He was always walking his beautiful little children, always walking and taking care of them," she said in tears. The St. Nicholas Avenue building where the fire started is the old St. Nick’s Pub, according to a witness who lives nearby. The witness also told News 4 New York that the film has been shooting there for weeks. The crime and drama film, which is set to be released next year, is about a lonely detective afflicted with Tourette syndrome, working to solve the murder of his only friend, according to IMDB. The movie is set in 1950 and is based on a novel by Jonathan Lethem. The producers of "Motherless Brooklyn" said in a statement that they immediately notified the fire department once they noticed smoke coming into the set and started alerting residents of the building so that they could get out. The FDNY said the fire was under control around 2:30 a.m. Friday, more than three hours after it broke out. It’s not clear what may have sparked the blaze. Spelman Beubrua was led, gasping and choking, out of his smoky apartment by firefighters. He lost all of his possessions in the fire. He broke down when he said the only reason he was alive was because of the FDNY. "I'm here talking to you, it's because of them," Beubrua said behind tears. "Then to come here and find out that one of them did not make it. It hurts. It hurts."